It’s just six weeks until the Cruel and Curious Exhibition for 2016 with the theme of Sanctuary. My mind has preoccupied with this theme for the past weeks and it is now time to work in ernest. I have known for several months that I wanted to paint on aluminium. It’s a tough unforgiving surface which allows me to concentrate on the process. It becomes all about the paint; the feel, the lustre, the texture and alchemy of colour and materials. I have a library of images to work from but it’s always good to have more. Duckpool and Coombe Valley are where my focus for the exhibition is fixed but a trip last night to Widemouth Bay provided me with the ideal conditions for some balmy diffused light images as the sun was going down. There will be more to follow on this journey of exploration and my story for this year’s ‘Cruel and Curious’ Art show, so pop back for more art musings over the coming weeks. Here are a few images to inspire. 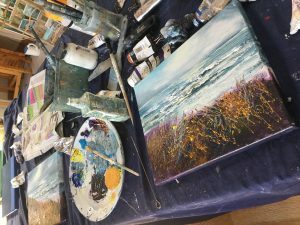 I have been asked several times if I do art workshops. I have always said no, but when approached for a one to one and share some of my techniques, I thought I’d give it a go and record it in my art blog. If I’m honest, I wasn’t looking forward to it. My lady sounded lovely but I had no firm lesson plan. Was this a good idea? I have been on several workshops myself in large groups and understand that they need to be structured but a one to one was always going to be a more personal experience. I decided the most important thing was to listen, be patient (not my strongest point) and for Cath to go away with something at the end of the day; hopefully a near completed painting albeit small. I knew that she wanted to learn about painting seascapes and loosen up. I looked at Cath’s work too and hope I provided an encouraging critique. After loosening up with some bamboo and ink sketches outside, we worked on some composition and tonal thumbnails. A brief introduction into colour and techniques using the shapers and palette knife along with other devices, we decided on an image which had some foreground but also the sea. Working alongside step by step Cath completed a wonderful little masterpiece, full of colour and movement. At the end of the day, tiring as it was, it was incredibly rewarding. It wasn’t only Cath that had learnt a lot. I had a total realisation of the amount of knowledge I have and the style and technique I have developed over the past years which is totally unique to me. The pressure of the brush, the weight of the paint, the angle of the drag and that spatter is really hard to control unless you have my hands. There may well be more so if interested please get in touch. A melting pot of creatives from all walks of life, from the depths of Cornwall to the heights of London, it’s the people as well as the stunning location that make this festival so special. The sunshine and balmy nights added to the glorious atmosphere with twinkling lights and braziers glowing as the festival go’ers got into the swing of relaxing and enjoying it just for what it is…. fun, smiles, connecting with new faces and meeting old ones; learning something new, discovering crafts and wanting to buy a hundred books after listening to the most interesting conversations and stories in the literary and cook tents.